Supplementary material reads: "Gershon. City desk. Illus. Fireboat launching. 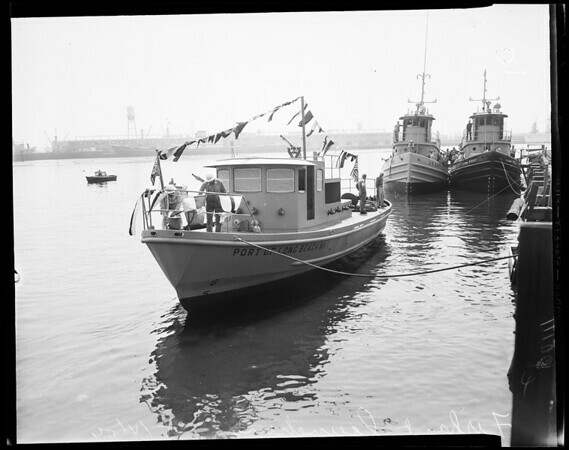 Nos 1-2 -- (posed) Mrs. Francis Reider ready to crack bottle of Champagne on Long Beach's new fireboat. Holding roses is her husband, Francis Redder, president Long Beach Harbor Board, and Fire Chief Frank Sandeman (tall) and Rusty Fellows, president of Fellows and Steward shipyard. No 3 -- Actual cracking. Mrs. Reider gives hefty swing and bottle smashes against side of new Long Beach fireboat. Back of her is daughter Mrs. Dorothy Frazier, Mrs. Eloi Amar, Mrs. Frank Sandeman, Fire Chief Frank Sandeman, Rusty Fellows".